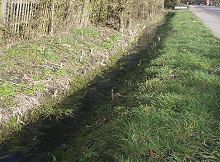 Riparian Responsibilities - Who is responsible? 01252 879060 when a representative from the Citizens Advice Bureau is at Sandhurst Council Offices on Tuesday mornings, every other Tuesday, during term time only. British Telecom have launched a scheme which enables local communities to retain their iconic red telephone boxes. Some Sandhurst residents may have fond memories of this British institution used by many people before the advent of the mobile phone. They have been in decline over the past decade with many being removed by BT as they are no longer viable. Little Sandhurst has the last remaining red phone box in the town. It is located close to the Bird in Hand public house adjacent to Edgbarrow Rise. There are a vast array of ideas for reusing the phone boxes, some already adopted are being used as a grocery shop, a wildlife information centre, a book exchange scheme and a home for a defibrillator (there is one of these already house in the Bird in Hand). Sandhurst Town Council would like to consult its residents on the requested adoption of the kiosk. Let us know with a yes or no if you are in favour of the adoption of the phone box and also include a suggestion for its use. The consultation will close on 30th April 2019 and the findings will be published. Nomination papers must be delivered to the Returning Officer at Time Square, Market Street Bracknell, RG12 1JD on any working day from the date of publication of this notice (excluding bank holidays) but no later than 4pm on Wednesday 3 April 2019. Nomination papers may be obtained from the offices of the Returning Officer, Time Square, Market Street Bracknell, RG12 1JD or can be downloaded and printed from this webpage: https://www.bracknell-forest.gov.uk/elections-and-voting/candidate-and-agent-information. If any election is contested the poll will take place on Thursday 2 May 2019. Applications to register to vote must reach the Electoral Registration Officer by 12 midnight on Friday 12 April 2019. Applications can be made online: https://www.gov.uk/register-to-vote. Applications to vote by emergency proxy at this election on the grounds of physical incapacity or for work/service reasons must reach the Electoral Registration Officer at Time Square, Market Street Bracknell, RG12 1JD by 5pm on Thursday 2 May 2019. The physical incapacity must have occurred after 5pm on Wednesday 24 April 2019. To apply on the grounds of work/service, the person must have become aware that they cannot go to the polling station in person after 5pm on Wednesday 24 April 2019.